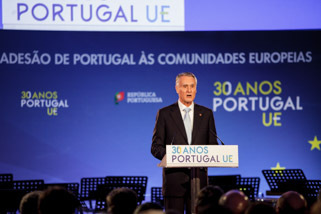 The President of the Republic addressed a message of congratulations to the six young Portuguese who were awarded medals in the International Mathematical Olympiad, held in Colombia, as well as to the Portuguese Society of Mathematics, to the officers responsible for the Delphos Project, to the schools and to the families. The President of the Republic addressed a message of condolences to the King of Spain, D. Juan Carlos, over the victims of the railway accident occurred in Galicia. The President of the Republic addressed a message of congratulations to Philippe, the new King of Belgium. The President of the Republic addressed a message of condolences upon the passing away of Cape-Verde songster Adriano Gonçalves (Bana) and to his Cape Verde Counterpart, Jorge Carlos Fonseca, and to the Family of the deceased. The President of the Republic addressed a message of condolences to D. Virgílio Antunes, Bishop of Coimbra, upon the passing away of the Bishop Emeritus of Coimbra, D. João Alves. The President of the Republic congratulated the Chancellor of Coimbra University and the Mayor of Coimbra upon the listing of Coimbra University in the roster of World Heritage by UNESCO, at the meeting of the World Heritage Committee now being held in Phnom Penh, in Cambodia. The President of the Republic addressed a message of congratulations to author Mia Couto, who has been awarded the 2013 Camões Prize. The President of the Republic addressed a message of condolences to the Family of town planner and university professor in the Higher Institute of Technology, Manuel da Costa Lobo.